It is not Le Tricolore but the Il Tricolor, the Italian tricolour flying highest over La Grande Motte in the South of France after the first day of gold fleet racing at the Nacra 17 World Championships. But with six races and Sunday’s medal race still to go 2017 championship is wide open, with just 10 points between the first seven crews, and top coaches and medal winning athletes alike expect this chase go down to the wire on Sunday’s medal race. Now sailing with Maelle Frascari, Italy’s 2016 Rio Olympic helm Vittorio Bissario won the first race today as the first crew to start close to the pin, left end of the start line and break first away to the favoured left. They lead all the way around the course, benefiting from the bend on the left side of the course and the slight extra pressure. In contrast compatriots Tita and Banti had a poor start and had to fight back to 15th in the 24 boat gold fleet. Roller coaster leaderboard In the 10-12kt sea breeze conditions which remained relatively stable through the three races, increasingly the fight to get off the line and escape in good shape drew casualties. Britain’s Ben Saxton and Katie Dabson suffered a U flag disqualification which, after a 15th in the third race dropped them from second to fifth for the day. Among the top title challengers their weighty error was not isolated. 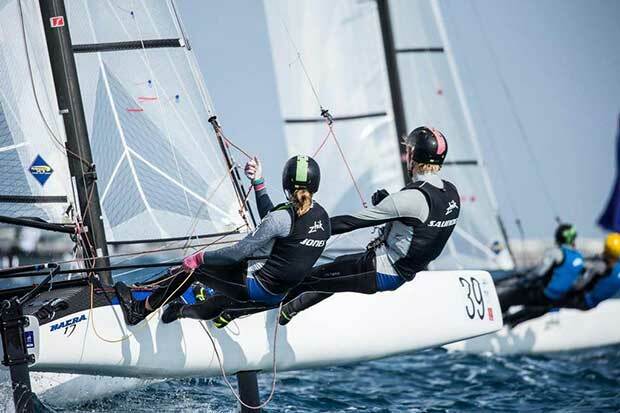 No sooner had New Zealand’s Gemma Jones and Jason Saunders gone 2,8 to lead the regatta than they capsized in the third race to finish 24th. Lying second Spain’s vastly experienced Fernando Echavarri warned, “This is still a long championship with six races to go. Every race it is easy to make a mistake and once you make a mistake or go to the wrong side it is really, really difficult to get back to the top. It is going to be about the balance between taking just enough risk and too much risk to get into good positions”. The leaderboard roller coaster continued as France’s top duo Moana Vaireux and Manon Audinet, based in La Grande Motte for much of the year, made their second bad start from three to finish eighteenth, dropping to seventh. 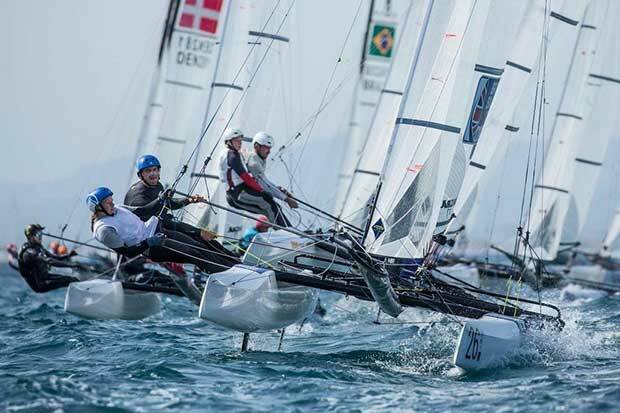 And Danish duo Lin Ea Cenholt and Christian Peter Lübeck could not impose themselves as they lead the qualifying series, today going 16,13,13 to drop from first to fourth. Racing continues Saturday and Sunday with forecast for Medal Race day, the deciding finale, promising 20+ kts.